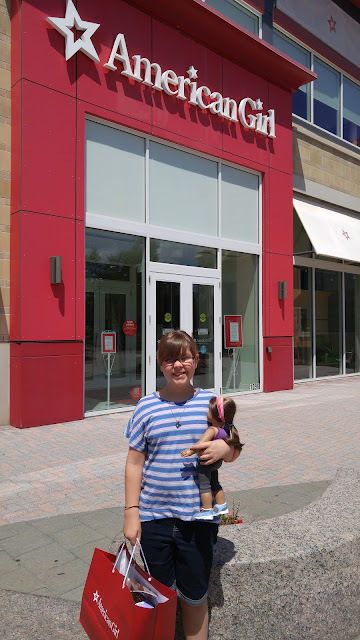 We took our daughter to the American Girl store this weekend. We have been promising to go for about five million years and something always comes up. This time we actually made it. The picture isn't that great because it was so sunny I couldn't see the screen so I just aimed my phone in the right general direction and this is what I ended up with. She looks happy, doesn't she? If you have never been to the American Girl store then just imagine two floors of dolls and clothes and accessories. Add in a cafe, a doll hair salon, and many, many fathers standing on the edges of the store with the slightly long-suffering look of men who are being good fathers but who don't quite know how they ended up in this world of girl stuff and who are, sometimes unsuccessfully, resisting the urge to pull out their phones and escape for a bit. My daughter loves it. She is not a super girly type girl but there is something about these dolls that just really appeals to her. I think it is that the dolls are girls, not babies, and you can buy clothes and accessories to fit your interests. So my daughter has a pet for her doll (yes, really) and sports outfits for her, and clothes she would wear herself. There are also historical character dolls with books to go along with them but my daughter doesn't have one of those. I have picked up many of the books at thrift shops though. I like it because it is nice to see girls being little girls and not trying to be grown-ups. There were lots of girls of widely varying ages, many of them older than my daughter. They were all wildly excited and just being their age. I like kids to be kids. Of course, it is ridiculously expensive but we don't go very often so we will have time to pay off that second mortgage. Something I find interesting is that my daughter tends to tie her reading into whatever she has been doing lately. So when we went to the zoo last month she spent a week or so reading Thornton Burgess books and other animal stories. This week she is reading books that involve dolls in the story. First, she pulled out A Little Princess by Frances Hodgson Burnett but she has read it so many times she practically has it memorized. Then she read the Raggedy Ann and Andy stories by Johnny Gruelle. I loved those when I was little. The idea of dolls having their own lives when people weren't around was thrilling to me. For a long time I was convinced my dolls came to life and had adventures when I was out of the house and I would always check to see if they were in different positions when I got home. Next she read The Racketty-Packetty House by Frances Hodgson Burnett. It is the story of two doll houses and the dolls who live in them. I never read it as a child but I found it for free on my Kindle and my daughter has loved it since she was tiny and I first read it to her. Right now she is reading Miss Happiness and Miss Flower by Rumer Godden. It is the story of a lonely little girl and the two little Japanese dolls that are sent to her as a gift. The girl decides to make a Japanese house for them and in the process, learns to be happy again herself. I read it as a child but only remember it vaguely. I am going to have to read it when she is done. She finished Miss Happiness and Miss Flower while I was writing this. She has requested that we go to the library tomorrow because she thought of another book, Two Are Better Than One by Carol Ryrie Brink. I believe there are two pocket sized dolls in the story and the best friends pass them back and forth. I don't remember much more but I read that when I was young as well. Do you have any recommendations for books that involve dolls as a large part of the story line? I am running out of ideas and she keeps asking for more. Do you ever match your books to the activities in your life? The Rumer Godden doll books are lovely. I went hunting and found that one of my favorite adult authors, Jane Gardam, wrote a book called Through the Doll's House Door -- I had no idea! Then there is The Doll People by Ann M. Martin -- I have not read it, but my younger sister loved it as I recall. I did read Amy's Eyes by Richard Kennedy but have no memory of it. From the description it sounds interesting and a bit weird. The Mennyms by Sylvia Waugh is another good one. And if your daughter is willing to branch out to toy soliders etc., there's The Castle in the Attic, The Indian in the Cupboard, The Return of the Twelves, and Knight's Castle (which I'm just finishing reading to my son). I hope you make some more discoveries and share them with us. Thanks for all the suggestions. We had just gotten home from the library when I read this so we will have to look for some of them next time. We did get The Doll People since someone on Twitter had already recommended it. I'll probably just manage to come up with a comprehensive list of books about dolls and my daughter will move on to another interest. Jane Gardam is a favorite author of yours? I don't think I am familiar with her. I'll have to try her books. There are the early Little House books, with Charlotte the rag doll. It's so sad in Plum Creek, when Laura has to let the little neighbor girl take Charlotte, and finds her later in the mud puddle. Beth in Little Women collects the unwanted dolls from her sisters, and runs her little hospital. And I think Daisy & Demi sacrifice a doll, in Little Men. Charlotte is the first doll I thought of. I vividly remember the picture of her abandoned on the ground. I can't convince my daughter to read Little Women. Someone told her that Beth dies and now she has no interest. Maybe a doll hospital will win her over. I can only think of The Fairy Doll by Rumer Godden, about a doll that sits at the top of the Christmas tree. The Fairy Doll helps give an awkward and clumsy little girl confidence. It's a lovely read for children of all ages. I never heard of that one. I read some of her other doll books when I was young though. My daughter's requests for themed reading does make me wrack my brain for titles. I end up remembering books I haven't thought of in years.